Earn $6.89 in VIP credit (689 points)What's This? 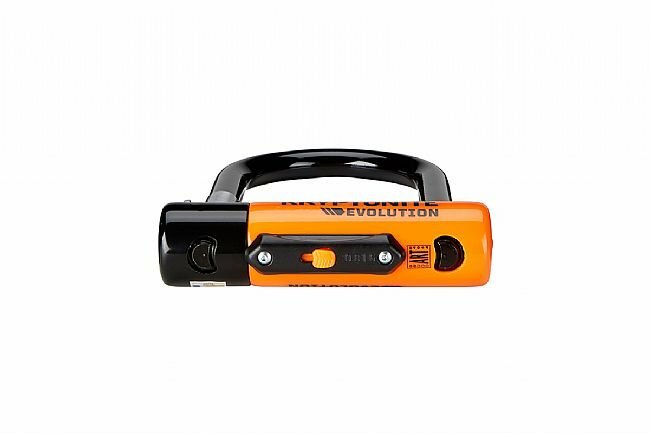 The Evolution Mini-5 U-Lock offers tough security in a compact design that fits in your pocket. 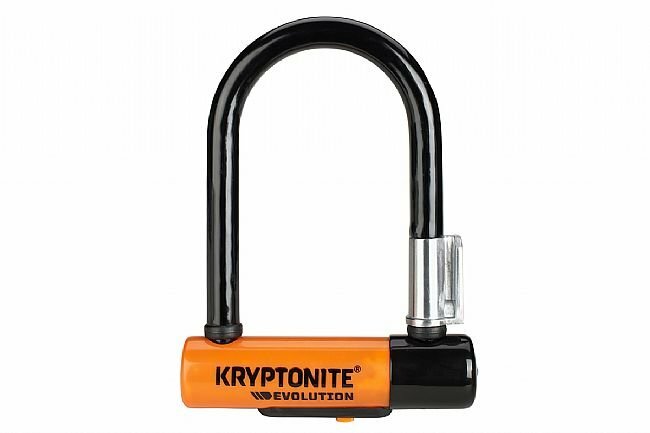 The 1/2" (13 mm) through-hardened Kryptonium TM Steel shackle resists bolt cutters and leverage attacks. New & Improved high security disc style cylinder is pick resistant. Patent-pending HARDENED DOUBLE DEADBOLT design gives additional protection against twist attacks. 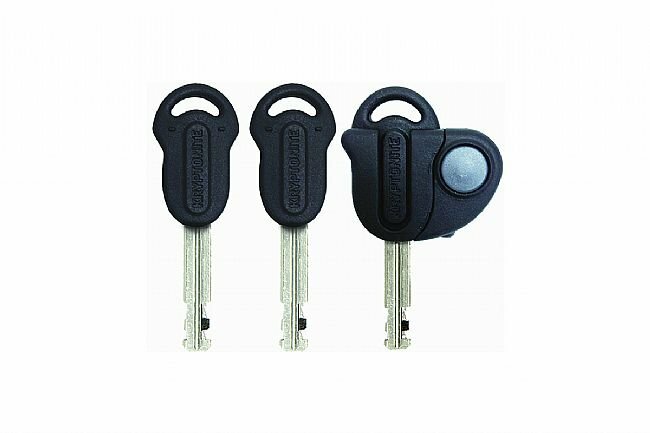 Three keys - one lighted for nighttime use. Includes versatile EZ Mount transportation bracket that reduces rattle in transport. Replacement keys available. Limited Lifetime Warranty. MODEL NUMBER: 002062. 6 of 8 customers found this review helpful. I've owned one of these for years never had a problem, and I love how small it is. This lock is perfect for locking my bike up in downtown Seattle. I take the front wheel off and lock it to the frame and back tire to ensure everything is steal proof! I definitely recommend this lock and store! Great lock, size may be a little small for someone looking to lock frame, rear wheel and front wheel to a stationary object. Also, the terms of the Kryptonite guarantee can be difficult to meet I know. It's a solid lock just don't expect the guarantee to be an automatic pay. As for locking there's always a way to get a bike, just make yours harder to get to than the next guy's. Depending on where you park and how long you'll be away, consider tethering your saddle with a small cable, remove everything that someone could take off e.g., skewers. But know that a 456 wrench will get a thief your fork, handlebar, stem, brakes, etc. in 2 minutes or less. Will and have locked up any bike with this lock. Small enough to fit in a back pocket and around any poleparking structure. The light-up key works great for late night rides. Plus having the anti-theft offer from Kryptonite makes me feel safe in locking up the expensive bikes downtown. I originally had purchased an Ottolock and had it jam on me in it's 4th use - I cut it off in under 2 minutes with a set of dikes (wire cutters) - eek! Not very safe! - So I purchased this Mini-5 Evo instead, and it is much more secure feeling, and lighter than it's 2.65 spec (it weighs only 2.24, for all you gram crackers out there...). A good lattegrocery getter lock. Combine it with a cable if needed for more flexibility. The Mini U-lock is small and tough. It is the perfect lock for around town, where posts and bike racks are plentiful. My preferred method of locking is around the rear rim, inside the rear triangle of the bike, to the post or rack. This way, both my rear wheel AND my frame are secure. For added security, a cable lock can be used to make the front wheel doesn't run away. 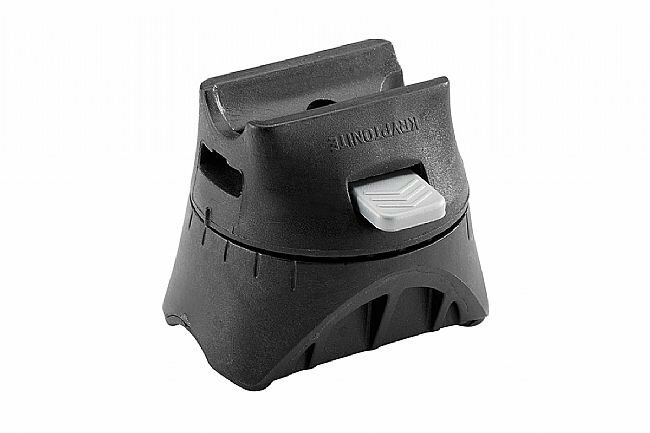 This lock works best on bikes with skinny tires, though it has certainly done well on mountain bikes, too. Minimal space is left between the bike and the rack, so there's not much room for tampering with this lock. Secure it to your frame with the included lock bracket when not in use; it also fits in most back pockets and all messenger bags. A great purchase for city riders! Rock solid and great protection. Easy to carry. Only downsides are heavier than it looks (the cost of increased security) and too small to lock up two bikes to most racks. I also have a Kryptonite Series 2 for my commuter bike but I wanted a more compact and sturdier lock to protect my custom fixed gear. I also seriously considered ABUS Mini-U but I chose Kryptonite because it was slightly more compact ( I think ABUS's locking cylinder is thicker) and lighter AND it also came w frame attached lock carrier and a key w built in light. I think ABUS is a stronger lock but I felt the Kryptonite was strong enough to meet my needs. I would have given 5 stars but their manual for installing the lock carrier as well as the bike insurance was very poor. A well established company like Kryptonite should know better and provide good user experience through out the entire process. Select the right lock to keep your bike safe.